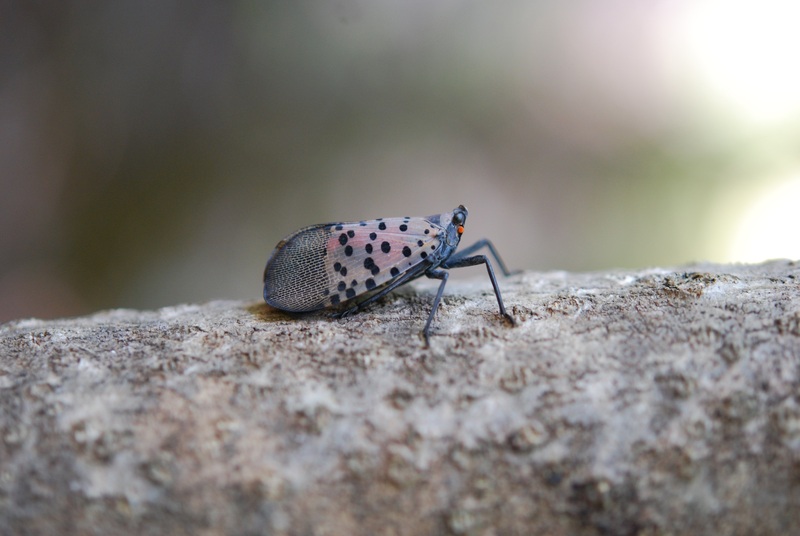 According to a tip from OSU Extension entomologist Robin Rosetta, a new insect pest — the spotted lanternfly (Lycorma delicatula) — was recently detected in Berks County, Pennsylvania. In response, the Pennsylvania Department of Agriculture announced a quarantine with the intent to restrict the movement of this pest. This is the first detection of spotted lanternfly in the United States. This planthopper from Asia has been found on a range of hosts including grapes, fruit trees and pines. It often migrates to Ailanthus altissima (tree of heaven) to overwinter, but can also be found on other host plants — any smooth-trunked tree, stone or smooth, vertical surface can provide a potential host for eggs. Man-made items such as vehicles, yard furniture, farm equipment or any other items stored outside are additional sites for egg laying. Egg laying begins in late September and continues up through the onset of winter. Click here for more information on this new pest and detection signs to look for.